A group of Democrats sent a letter to House Democratic leaders urging them to extend expiring tax breaks for all income levels. 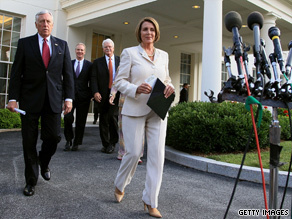 Washington (CNN) - Thirty-one House Democrats, most of whom face tough re-election bids this fall, have signed a letter to House Speaker Nancy Pelosi and House Majority Leader Steny Hoyer urging them to extend expiring tax breaks for all income levels, including the wealthy. Pelosi and other House Democratic leaders have made it clear they support President Obama's proposal to vote on a bill that only renews tax breaks for those making $250,000 and under. But with the midterm elections less than two months away, leaders have not yet decided whether they will schedule a vote on the legislation before voters go to the polls. The letter–written by Utah Rep. Jim Matheson, Illinois Rep. Melissa Bean, Virginia Rep. Glenn Nye and Michigan Rep. Gary Peters–states that after listening to economists, small businesses and families over recent weeks they are concerned that "raising any taxes right now could negatively impact economic growth." "We believe in times of economic recovery it makes good sense to maintain things as they are in the short term, to provide families and businesses the certainty required to plan and make sound budget decisions. Providing this certainty will give small businesses, the backbone of our economic recovery, confidence and stability," the lawmakers wrote. CNN reported that the four authors were circulating a draft of the letter earlier this week. But with more than 30 Democrats now signed on to the final letter, Democratic leaders will face increasing pressure to address the concerns of these moderate members. Republican congressional leaders have been making similar arguments, pushing for a two year freeze on all current tax rates. Earlier on Wednesday, Hoyer told reporters he could consider proposals to extend tax cuts for higher wage earners, but he also stressed his strong support for just renewing the middle income tax breaks. Later Wednesday, Hoyer released a written statement noting he was simply saying he was willing to talk to others about their positions. "Unfortunately, the reports of my answer implied a willingness to support an extension of Bush policies," he wrote. "That is incorrect." Republicans always want to help the rich people and they forget about the middle-class people. It's no fair. Either the tax cuts are wrong or they're right. You spend half the year calling them "George Bush's evil tax cuts", then the other half of the year saying they need to be extended. All so you can keep your jobs. It isn't the raising or not raising the taxes that are going to send you all packing (well, not only that). It's the lying, two-faced, pandering that you all do. We have already seen how many jobs have been created by the Bush tax cuts... nada. If they are not working now, why not apply $70 Billion a year towards the budget deficit? It's called being responsible by paying down debt. Obama is getting attacked, no matter which way he turns. This is why the Democrats will fail! They cave so easily! if Democrats can't stand up against the wealthiest 2% then they have no business being in Congress. These Democratic cowards need to grow a backbone! What a bunch of spineless politicians. They sound like the republicans, catering to the 3% of the nation that doesn't need tax relief. These are the folks that invested their "Bush" money overseas for the last 10 years.